I am not sure if anything tests the limits of my patience more than a long road trip with my children. “Are we there yet?” “I need to go potty.” “The baby is touching me.” It just never seems to end. We go through all of this to create memories with our family. Sometimes road tripping is a preference, sometimes it is a budget saver, and sometimes it is just the best way to do a certain vacation. Either way, road-tripping with kids takes a little extra thought if we want to keep everyone happy and keep our sanity. 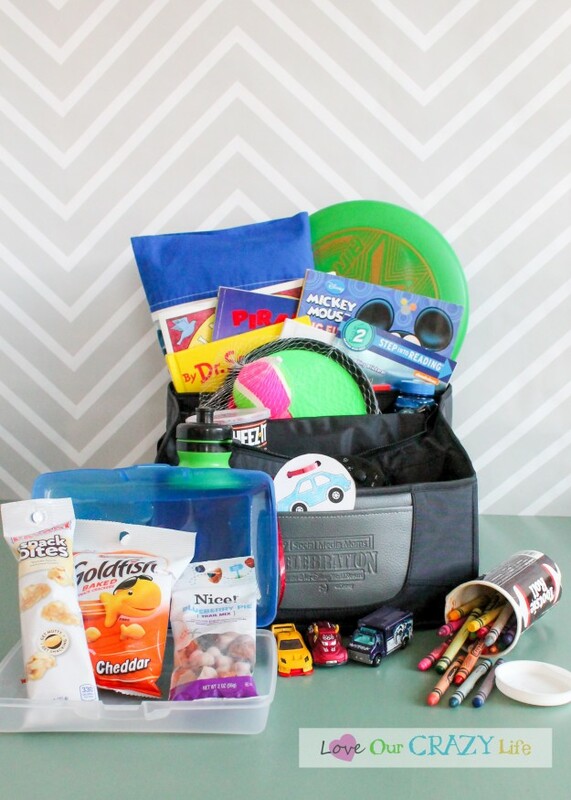 The one thing I have found helps us make road trips fun and keeps me sane is having a kid’s road trip kit. 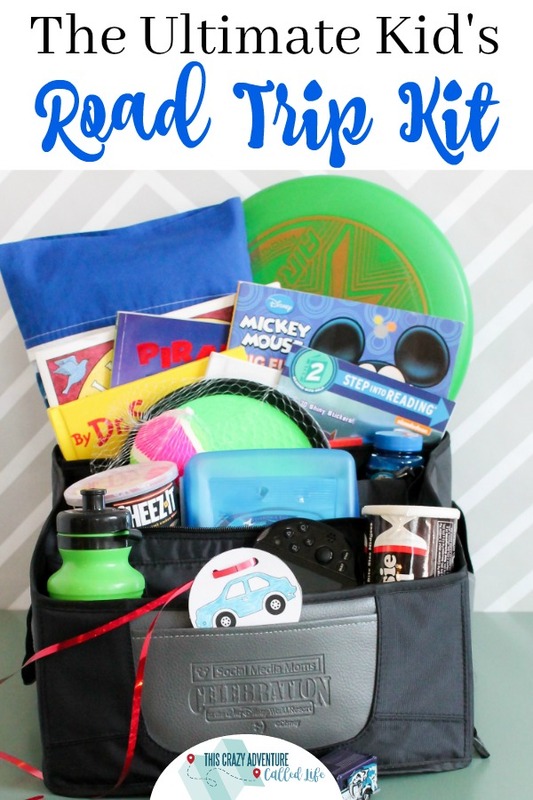 I have tried a lot of different items on our road trips (we average 2 long ones each year with several shorter ones thrown in) and I have found that there are some essential items you must have. 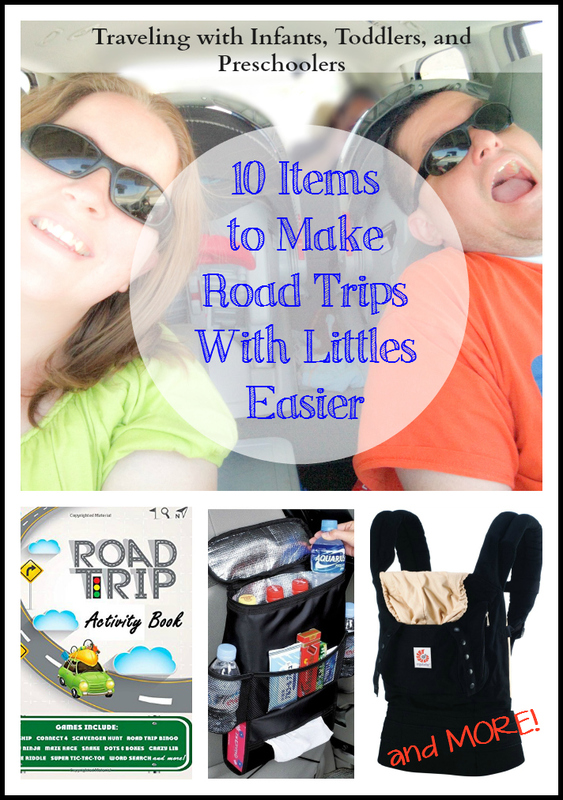 You can add on to them, but this is a great base kit for any road trip with your child. I am so excited to share it with you today, and a few extra hacks/tips as well. Depending on the age of your child this may vary. You will still take the same basic items most likely, but you will just tailor them to the age of your child. Books. Something for your child to read while you are driving, filling up on gas, or even when you get to the hotel. 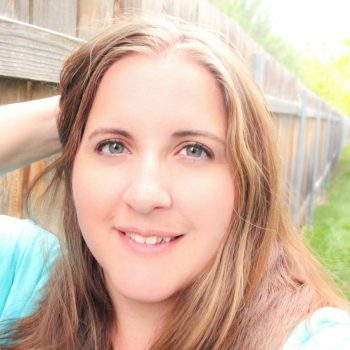 With the babies we took bath tub books so if they chewed on them it wasn’t a big deal (affiliate link). When the Goof was a toddler, we chose board books so we didn’t have to worry much about pages being ripped. Now he takes his learning to read and other books that have more depth and story to them. Coloring Books & Crayons. A variation of the books, this is great for kids who may get a little motion sickness if they try to read in the car but do okay with coloring. This is a great one for them to do while you put on some great music. We have a whole playlist called Kids Road Trip Music that we put on. We all sing along and the Goof colors. Toys. Books will only get you so far. Bring some toys that can be used in the car. Our last trip we brought toddler cars for our babies, hot wheels for the Goof. Chew toys were a great hit and the Goof brought some action figures. Make sure not to bring anything big or bulky and I never bring a favorite toy that is not replaceable. It would be awful to forget it or lose it somewhere and have to deal with that melt down when you get home. Water bottle. We like to get the sports water bottles for our road trips. They don’t spill if The Goof is drinking them and we go over a bump or switch lanes or something, but you can bring any type of water bottle you want. It is important to let kids drink and stay hydrated on road trips. I know parents like to think that it is a bad idea to give them water because they will have to use the potty more often, but it is best to keep them hydrated. Snacks. Make sure to have snacks for your kid. You can use them as a reward or to ward off hunger until the next stop. I will talk more about packing the snacks below, but right now I want to talk about snack choices. Pick snacks that are easy to clean up. By this I mean can be vacuumed. Chocolate or hard candies can melt and either stick to things or stain it. We usually stick with crackers, cheeses, chips, etc. Electronics & Headphones. You don’t need to give your kids free reign of these items, but taking electronics can be a life saver on day 3 of a week long road trip, or hour 14 of a 15 hour drive. We actually have limited the Goof’s use of electronics (iPad and PS Vita) to road trips or hospital stays, so it is a special treat for him to get to use them. We have headphones so that we do not have to hear his games or movies he has on, and we can still listen to music. We also have a parental control on his electronics so they time out so he can only play them for a certain amount of time. Rest Stop Energy Burners! If you have young kids, you know they have a lot of energy (I wish we could bottle that up and use it as adults.) I find it is really important to have something to help them burn off energy in our kid’s road trip kit. Put a frisbee, ball, or even bubbles in your kit so that you can use them at rest stops and have the kids run around and burn off some energy. Pillow and blanket. Have something to help make your child comfortable, and also to help them sleep. If we are driving early morning or over night, we usually keep the car pretty cool to help keep the driver alert (don’t worry we pull over if they aren’t). A blanket helps keep the kiddos warm. A pillow is great, especially for kiddos who may be out of car seats with head rests/supports. Getting the items is only half the battle. Packing the items is a big challenge. Especially when you have children that are still in car seats that sit in the back row of a minivan or SUV, or when you are tight on space. I am going to share how we pack our items, and hopefully it will spark an idea for you on packing your kit. Here are a few ideas for you. Hanging back seat organizers. These are great for kids who can reach the back of the seat in front of them while staying properly buckled in their seats. 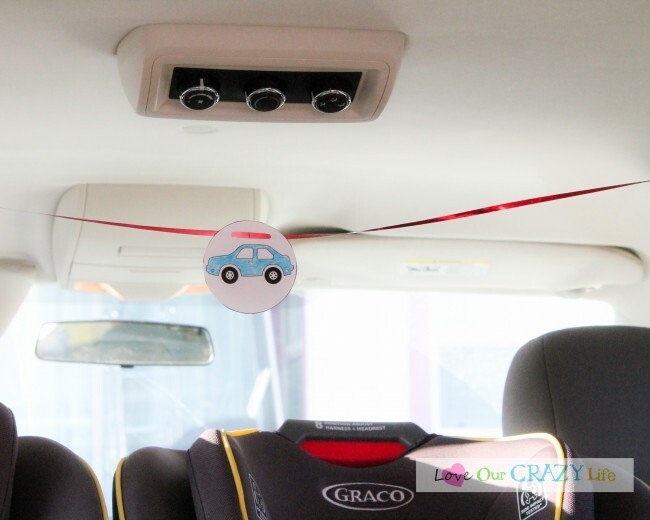 They take up very little space so they are also great for families who have a tight fit in their car. Car office organizers/gear organizers. I got this one from Disney Social Media Moms On The Road several years ago and I absolutely adore it. It is supposed to be a “office organizer” but I use it as our kid’s road trip kit center. It fits everything The Goof, and even the babies may need. I really like this one on Amazon as well (affiliate link), and it is one we have used when we have traveled with nieces and nephews. Snacks. 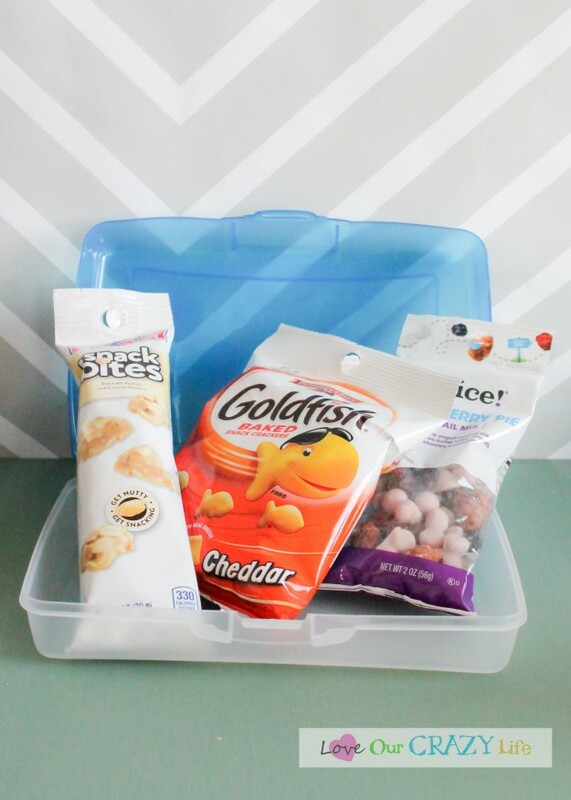 You can search pinterest and find a ton of ideas on snack organization. There is one that has you use a craft organizing box. I loved that idea, but when we tried it, the Goof spilled the entire thing. UGH! So we started putting individual packets in a pencil holder. That way he can just open what he wants. A lot of times I even put the items in ziplock bags so they can be sealed shut if he doesn’t finish the items (or if they have bags that are tricky to open). Crayons. This one is one of my favorite “hacks” I share with people. I actually came up with this for our church bag, but carried it over to travel several years ago. You know those Tootsie Roll Banks? You can usually find them at the dollar store. 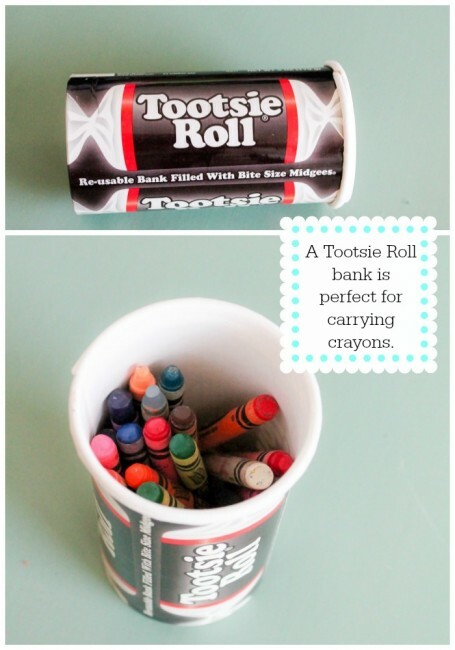 Simply take the tootsie rolls out and use it to hold crayons! I mentioned that it is important to have a way for your kids to measure time. This has really saved my sanity. But it took me a long time to figure out how to do this with kids who did not get the concept of time. I actually came up with this idea for a road trip with the Goof and our niece and nephew. Three kids, none of which could tell time back then (let alone understand the concept of a multi-hour drive) and constantly asked “are we there yet?” On the way home, I decided something had to change. I now do this for all of my trips. Are you ready to see what it is? We ran a ribon across the back (using either the handles or wardrobe hooks) and we print out a car (or draw our own) and punch holes in it. We put the ribbon through the car picture and we put marks on it to represent each stop or each hour. Then we move the car across the ribbon. The kids can see how far we have come versus how far we have left. We let them take turns moving it. Ever since that trip, we have done it with most trips with the Goof and it really helps, and it gives him something to look forward to at each stop. On the way back, you can either drive the car in reverse, or move it back and start over. 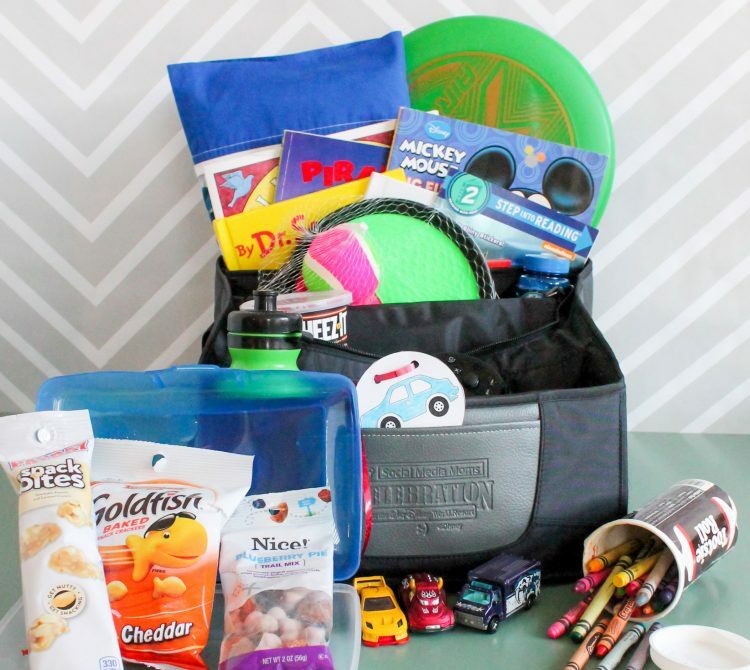 Hopefully your next road trip will be a little easier now that you know the essentials for your kid’s road trip kit. Do you have anything you would add to the kit? Leave a comment below letting me (and others) know. I LOVE your “Are we there yet?” solution! There’s a photo on my post of our similar “countdown”, but it was very specific to the trip we took. I love the versatility of that cute little car driving it’s way across the ribbon. Our road trip kit is almost identical. We take it on every road trip. My kids are a little older so I made individual binders with wipe off sheet protectors. It’s so important to have enough for the kids to do.